Air Duct Cleaning in California has been dedicated in providing top notch solution to all air duct components, regardless of the issues encountered. It is our main responsibility to provide the best customer experience. Thus, we only provide the most effective solutions for your air duct concerns. Contact us right now and get your evaluations done. The 24/7 hotline at Air Duct Cleaning West Hills provides the assurance that we can solve your needs, including the ones that are really urgent. We have employed top notch technicians who are capable of fixing the problems you encounter. Does not worry anymore, call our hotline now for urgent assistance! Allow us to do the air duct maintenance work for you while you focus on the things that are most important for you. 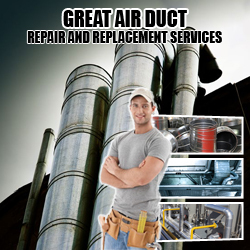 Our company offers a full array of professional solutions for ducts. Our air duct cleaning services are equally effective for the HVAC system and for dryer vents. We remove all types of contaminants from the ductwork of HVAC systems to give you the high indoor air quality that you require. With sanitizing, the surfaces receive reliable protection from future contamination. If our initial inspection reveals damage to the ducts, they will be repaired promptly. The seal will be fully restored. Count on us for other jobs such as dryer vent replacement in case of severe damage or extensive wear and tear.